When nine people wake up and unexpectedly find themselves imprisoned in separate confinement rooms, their immediate panic only worsens when a mysterious masked figure appears. Ordering that they participate in the Decision Game, the group are told that not only their lives but those of the entire human race hang in the balance. And then, the cloaked character flips a coin. Red or blue? It is a trivial choice that opens Zero Escape: Zero Time Dilemma, and one that, if you choose correctly, can see you complete it in a matter of minutes. But for those that guess the wrong answer, the characters are unwillingly thrust into the Decision Game, where every choice that they make can result in fatal consequences. This is merely the start of a machiavellian plot that all too quickly unravels in multiple, unpredictable directions. Kotaro Uchikoshi has been the creative force behind the Zero Escape series, and, as it comes to a dramatic conclusion, it is the fanbase, as well as the development team, that he has thanked for helping to make it happen. The nine characters are divided equally into three teams – C, Q and D – and placed in wards that are only connected to one another by an elevator shaft. Their only way of escape is to pass through a locked X-Door, granting access to the elevator and allowing them to reach the surface. But in a dark turn of events, six passwords are required to unlock the door and these are only revealed when a participant in the Decision Game dies. With a black bracelet locked on each character’s wrist, we are told that these contain an injector that activates every 90 minutes – applying an anaesthetic to force the characters to fall asleep and an agent that erases their memories. It is understandable, then, that Zero Time Dilemma sees players move through a sequence of story fragments. These act as 90-minute windows into the events that unfold as each team participates in the Decision Game, where the masked figure, who refers to themselves as Zero, presents the opportunity for teams to kill other participants with the hope of securing their own escape. Only one fragment is available to you at the start, but more unlock as the story unfolds resulting in divergent paths that lead to all manner of outcomes. As is now expected from the Zero Escape series, the gameplay setup is genius. The plot that Uchikoshi has penned is riddled with intrigue and keeps you second-guessing at every turn, the maddening situation that the characters find themselves in soon seeing even the closest friends start to believe their trust in each another is misplaced. Zero Time Dilemma is a visual novel at its heart, switching between Novel sections dominated by conversation and player choice that redirects the narrative, and Escape sequences. 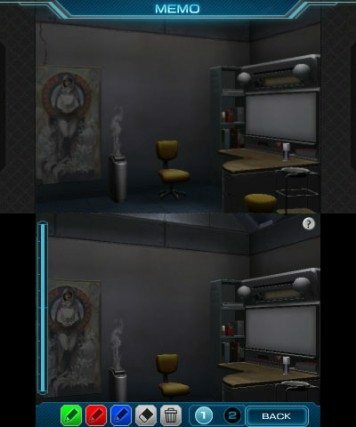 Those that have played either 999: Nine Hours, Nine Persons, Nine Doors or Zero Escape: Virtue’s Last Reward will be more than familiar with how these work, but, for those that haven’t, they are scenarios in which the characters become trapped in a room and must secure their escape. These see you searching the confines of the room that you in, rummaging through drawers, cupboards and toolboxes as you unearth items and clues that will aid your survival. While items can be combined, much of your momentary bemusement will come from how and where they are meant to be used. 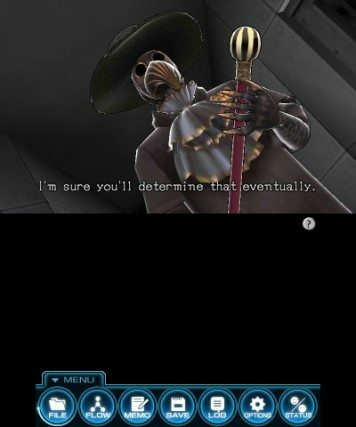 The puzzles that Zero Time Dilemma poses will easily stump you on repeated occasion, but you can look forward to the overwhelming feeling of reward once you work out their solution. Once you have bested the challenges that Zero has placed before you, players are usually met with a situation that questions their morality. These are often scenarios that play on the desperation circumstance in which the characters now find themselves, but add weight to the overall drama and spectacle that results. With multiple endings and the aforementioned fragmented non-linear story, Zero Time Dilemma packs plenty of moments that astonish and astound in equal measure. That isn’t to say that the game isn’t without its flaws, whether that be the inconsistent performance of the voice cast and animation quality or puzzle design that in places see repeat use. I wish that there were more games like Zero Escape: Zero Time Dilemma. As Telltale Games has achieved in recent years, Spike Chunsoft under Kotaro Uchikoshi’s direction has pushed the boundaries of what we have now come to expect from storytelling in the games industry. Zero Time Dilemma is a success in that regards, becoming one of the most thrilling narrative experiences to grace the Nintendo 3DS library.